Bin Laden's Protectors Got Off Relatively Few Shots, 'Times' Reports : The Two-Way Administration officials have publicly said the SEAL team's members were engaged in a firefight through most of the 40 minutes they were there. They now say one man fired at the commandos. Others were killed as they resisted; before they could shoot. The New York Times reports this morning that it has been told by Obama administration officials that "the only shots fired" by those who were with Osama bin Laden in his compound "came at the beginning of the operation" conducted by U.S. commandos. "Bin Laden's trusted courier, Abu Ahmed al-Kuwaiti, opened fire from behind the door of the guesthouse adjacent to the house where Bin Laden was hiding. After the SEAL members shot and killed Mr. Kuwaiti and a woman in the guesthouse, the Americans were never fired upon again." Bin Laden and two other men — one of them the al-Qaida leader's adult son — were also killed. Since President Obama told the nation late Sunday night that the world's most wanted terrorist had been found and killed in Abbottabad, Pakistan, administration officials have publicly said that the U.S. forces were engaged in a firefight that lasted through most of the 40 minutes they were on the ground. Now, the Times writes, it appears that the U.S. forces were "fired upon as soon as they touched down in the compound" and from that point on "they were under the assumption that everyone inside was armed." It adds that officials say the courier's brother was killed as he apparently prepared to fire a weapon, that bin Laden's son was killed "as he lunged toward the SEAL team," and that when commandos got to bin Laden they saw he had "an AK-47 and a Makarov pistol in arm's reach." -- Sunday, 11:35 p.m. ET: President Obama says that "a small team of Americans carried out the operation with extraordinary courage and capability. ... After a firefight, they killed Osama bin Laden and took custody of his body." -- Monday, 12:03 a.m. ET: "Senior administration officials" brief reporters. One says that bin Laden "did resist the assault force. And he was killed in a firefight." Bin Laden, an official says, "was killed in a firefight as our operators came onto the compound." -- Monday, 2 p.m. ET: John Brennan, the president's top counterterrorism adviser, tells reporters that bin Laden "was engaged in a firefight with those that entered the area of the house he was in." -- Tuesday, 1:57 p.m. ET: White House spokesman Jay Carney, during his daily briefing, says "the raid was conducted with U.S. military personnel assaulting on two helicopters. The team methodically cleared the compound, moving from room to room in an operation lasting nearly 40 minutes. They were engaged in a firefight throughout the operation, and Osama bin Laden was killed by the assaulting force." "It was a highly volatile firefight," Carney also said. -- Also Tuesday, CIA Director Leon Panetta tells the PBS NewsHour that "there were some firefights that were going on as these guys were making their way up the staircase in that compound" to where bin Laden was found. Question: "Jay, you talked yesterday a lot about firefight. Who was it that was shooting back at the U.S. commandos?" Carney: "We have, as you know, since the moment this operation became public been as helpful as we can be to provide as much information as we can. And in terms of the operational details, we have gotten to the point where we cannot cross lines because of the necessity for preserving the methods and operational techniques and capabilities of the kinds of forces that were used in this case. We've gone to the limit of our ability to do that and still maintain some of the things we need to maintain and be kept secret. "So that's a long way of beginning my answer to say that we've revealed a lot of information. We've been as forthcoming with facts as we can be. A lot of information came out quickly. When we needed to clarify some of the information that we had as more information came in, we've provided that. But in terms of further details of the operation, I don't have any for you. You're welcome to obviously consult with the Defense Department about them, but I don't have any more information. I'm not going to discuss beyond what I've said already the operational details." Question: "But some things, as you acknowledged yesterday, have changed as the information came in. Is the fact of a firefight solid?" Carney: "You heard the account that I read yesterday, and that is information that I provided. And I'm not — I'm just simply saying I'm not going further than that." The Times adds that "administration officials said the official account of events has changed over the course of the week because it has taken time to get thorough after-action reports from the SEAL team." Update at 3:30 p.m. ET. More From Carney. "Again, as I said yesterday, the Defense Department can take questions about — you have about further details on the mission or clarifications. We're still in a process of gathering all the facts of that operation. And the broader point here is that a group of extraordinary U.S. personnel flew into a foreign country at the dead of night and executed a mission and achieved a goal — executed a mission flawlessly and achieved a goal that had eluded the United States of America for almost 10 years." 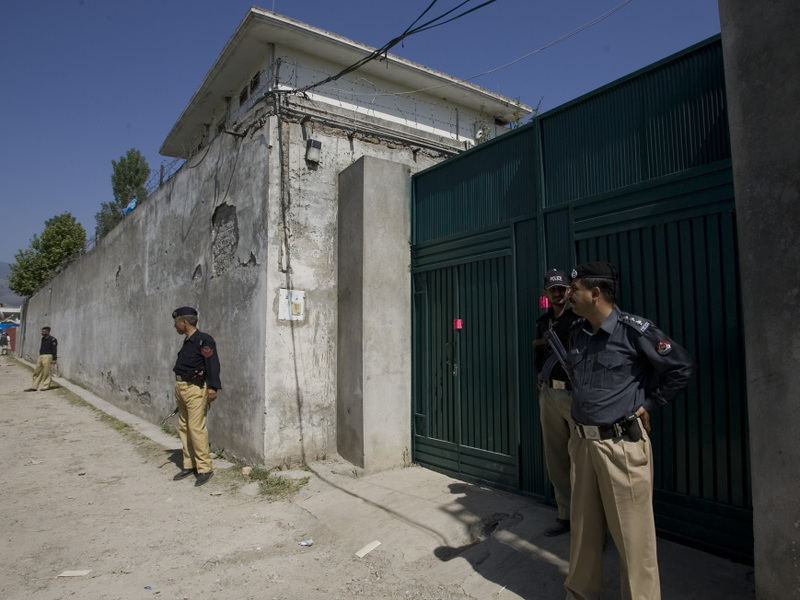 Pakistani police guard the gate of the compound where Osama bin Laden was killed by U.S. forces.